The idea was inspired by my company's (Scout24) summer festival party. I wore a Nigerian outfit and people complimented the outfit and asked where they could get it. I knew it would be hard for any none Nigerian to know the names of these kinds of attires so I decided to build some image recognition tool to address this. It simply allows a user to do a visual search for any African attire he/she likes, then the solution responds with similar attires. User can then click on any outfit of interest and proceed to buy from the seller. We also added a discovery feature where users can like or dislike pictures for instant recommendations - just like Amazon.com/scout. We built the prototype in 3 days. We didn't want to have anything to do with model training likewise managing any servers. Since, I was already familiar with AWS ecosystem, I looked at the available AWS solutions that would fit the architecture sketch on my notepad and went on to build. 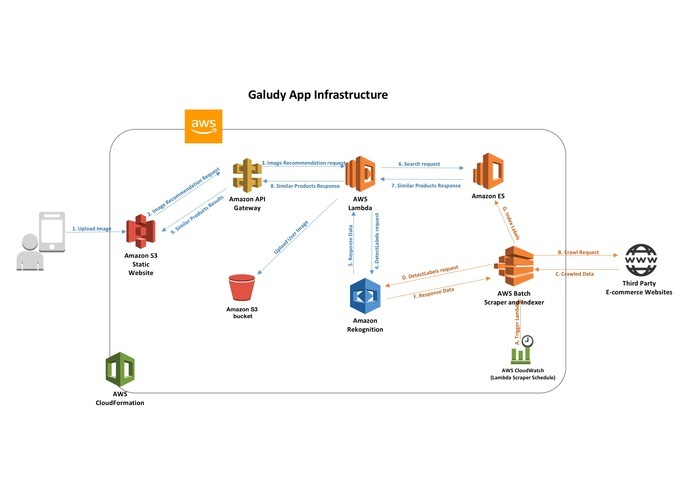 We also ensure all infrastructure was deployed via Cloudformation using AWS Serverless Application Model. We make use of AWS Comprehend to extract keywords from user search request and before querying our search. Nigerian outfits are very peculiar in design and image detection, hence a bit on non matching responses from AWS Rekognition. However, this didn't stop the solution from recommending similar items. To our surprise, it performed better than we expected. Train custom models (tensorflow or MxNet or Gluon on AWS Sagemaker) to improve recommendations. I worked on the UI/UX development of the application and also part of the decision making of the application.